Spring is definitely here, and summer is right around the corner. Today at Camp Caudle, we began construction on phase two of our new Adventure Playground. Last summer, we completed the lower portion of the playground, and our campers absolutely loved it! The elements of the lower playground are balance challenge elements arranged like spokes of a wheel, offering fantastic free-play opportunities for all of our age groups. 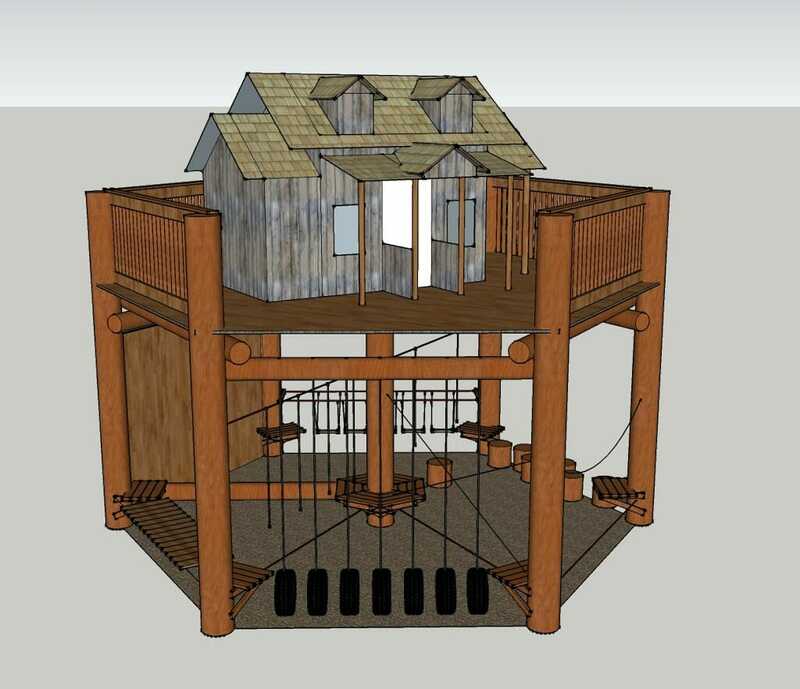 Next up is the upper portion of the Adventure Playground which will consist of a fort/treehouse/playhouse that will give a beautiful view of the whole campus. As we move forward, we plan to add climbing elements and slides, as well as plenty of other little surprises for our campers to discover. Here is a time lapse of this afternoon’s work as the framing for the tree-fort went up. Thanks to Charles May for his willingness to volunteer his hard-earned retirement time to help us in so many ways over the past few years. He spent most of the day today on his knees driving screws down through the 2×6 decking on the second story of the playground. 3-D Concept sketch showing what our Adventure Playground will look like. Also, thank you to all the donors who have supported the Don Helms Continue the Dream Campaign. Your support has made the addition of the Adventure Playground possible. Working together…to win as many as possible.